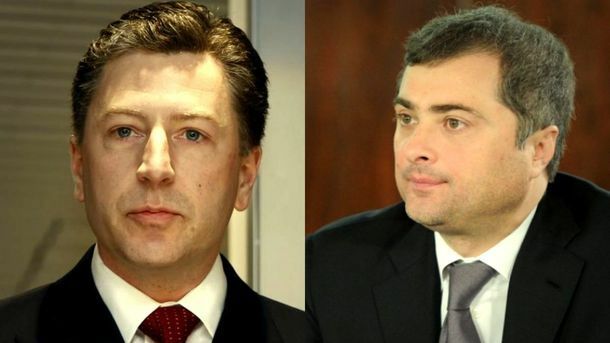 Volker vs Surkov. What awaits Ukraine? On August 21, the United States Special Representative for Ukraine Negotiations Kurt Volker met with the Russian Presidential assistant Vladislav Surkov in Minsk, said the spokesperson of the Ministry of Foreign Affairs of Belarus Dmitry Mironchik. According to him, the meeting, which was held behind the closed door, began at about 2pm, and ended after 5pm. There is currently no information about its results. The parties discussed ways to resolve the Donbas conflict. Kurt Volker did not plan to communicate with the media on August 21. What should Ukraine do: rejoice or wait? Volodymyr Ariev, MP from Petro Poroshenko Bloc, Chairperson of the subcommittee on interparliamentary liaison office, bilateral and multilateral relations of the Verkhovna Rada of Ukraine Committee on Foreign Affairs, considers it a good sign that the meeting between Volker and Surkov was held not in Moscow but in Minsk. “Volker, in fact, performs the functions once assigned to Victoria Nuland. She went to Moscow to negotiate with Surkov. Obviously, this time the US side wants to meet in the territory where negotiations are taking place.” According to him, now Americans want a much more serious conversation with Russia. Dmytro Tymchuk, MP, leader of the “Information Resistance” group, also believes that the scenario of the rapid withdrawal of Russian troops from Donbas is too optimistic. However, in his opinion, if such a decision is made, Moscow will reserve some scenario to continue to influence these territories. At the moment neither the White House nor the leaders of France, Germany, and Normandy format countries have commented on the meeting between Volcker and Surkov. First reacted Lithuania, where on August 22, after the meeting with Surkov Volker came to, to meet with Lithuanian president Dalia Grybauskaitė in Vilnius. According to the press service of the President of Lithuania, the conversation was about the situation in Ukraine. “In the conditions of the ongoing occupation of Crimea and Russian aggression in Donbas, Ukraine needs international support. It is extremely important that the sanctions against Russia imposed by the United States and the EU continue until the Minsk agreements are fully implemented and Crimea will be returned to Ukraine,” the statement runs. James Marson, political columnist for The Wall Street Journal, believes that Volker met with Surkov to test Russia’s readiness to settle the conflict in Donbas. After all, it was Surkov whom the Kremlin appointed the coordinator of militants in Donbas. “Putin is the father of separatists, and Surkov is their nanny,” the journalist quotes Valentyn Nalyvaichenko, the former SBU head. On August 23, Kurt Volcker will visit Kyiv, where he will join Defense Secretary Jim Mattis in meetings with senior Ukrainian government officials of to discuss the next steps in the diplomatic negotiations. Perhaps the situation will become clearer after this meeting. But understandably, the path to a complete cessation of the conflict will be long and difficult.